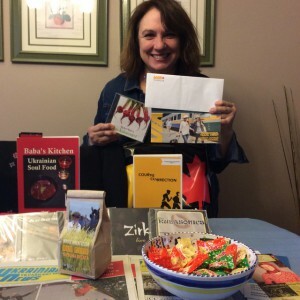 The winner of the 125th social media contest Grand Prize was Lori from Winnipeg, Manitoba! We asked her to respond to a few questions in a Vanity Faire style. Check out the answers below along with photos of all of the items included in the Grand Prize! 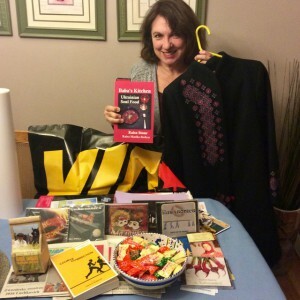 1) Canadian things that used to be Ukrainian: Pierogies, Holubtsi & Babushkas! 4) Earliest memory of Ukrainian Culture: Visiting my grandmother in the country and enjoying her homemade foods and the extended family all speaking in Ukrainian. Foods are so often an important part of our memories. We also attended socials and weddings with the extended family in Northern Manitoba, where we experienced lots of traditional Ukrainian dancing and celebrations. 9) Which do you engage yourself in the most: Though I am not very good, I do enjoy photography. 10) How do you keep traditions alive in the home? By practicing them with my family and creating traditions along with my husband who is of a different background. Foods are one way that my children know more about the Ukrainian traditions. 11) What is the most Half-na-piv thing you know how to say? I cannot answer this because I do not know what the word means, but if it means “most Ukrainian” words i know how to say, they would be simple words like Baba, Babushka, or Holubtsi! I never learned to converse in my Father’s family’s language. 12) What is your favourite food? Holubtsi—I absolutely love Cabbage Rolls and i can make them pretty well! 13) I could not understand a lot of what my Baba said as she spoke with us…she tried to speak English to her grand kids. However i do remember they way she sang to us as kids…music transcends the distance between languages. I will always have special memories of my Baba!